Summit Cabinet Coatings offers the highest quality kitchen cabinet makeovers in Northern Colorado with a refinishing process that is unlike any other. They take complete satisfaction in converting your worn out kitchen into a bright, fresh environment that you simply cannot wait to get home to. At a fraction of the price of replacing all of your existing kitchen cabinets, Summit is able to produce a unique and bright look without the hassle or price tag of a traditional kitchen remodel. The Summit proven process and technique takes five days or less and they offer an array of finishes that are stain resistant and come in any color that you could possibly imagine. 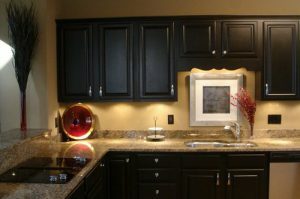 The new coatings are easy to clean, will protect your cabinets from any water damage, and will not crack, peel or fade. In addition, while the kitchen cabinet refinishing is taking place, kitchens remain clean and usable throughout the process. Only three days are spent in the actual kitchen, while all remaining time is spent off site in the shop. They are able to achieve a beautiful transformation with the convenience of being able to use your kitchen the entire time. All existing cabinet doors and drawers are removed from their frames and taken to the shop. Kitchen cabinets and door fronts are washed, sanded, primed, repaired of cracks and blemishes, and any gaps are caulked. Each piece receives 2-3 coats of a commercial grade acrylic coating which is applied in a contaminate-free spray booth. After the final coat of acrylic or glaze is applied, another coat of clear, protective polyurethane is also applied. During this process, three days are spent in the actual kitchen in order to coat the frames. This process involves washing, wet-sanding and taping off your kitchen then repairing, and caulking. Once the frames are ready, the primer, acrylic, and clear protective polyurethane coats are also applied to all frame surfaces including the inner and underside lips of the frames, toe-kicks, side panels, and crown molding. Once all frame surfaces and cabinet drawers and fronts are complete, Summit reinstalls everything and also installs new knobs and pulls to complete the look. Summit Cabinet Coatings has worked in an array of kitchen environments and always leaves behind a beautiful kitchen and a happy customer. When it comes to refinishing kitchen cabinets, Summit Cabinet Coatings is the real deal. Call them for a consultation today!